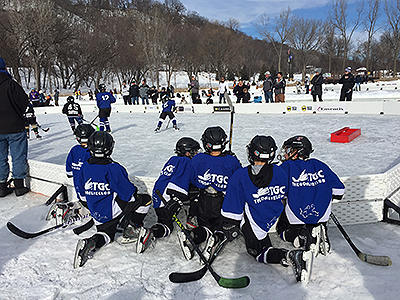 On January 28th, The Goalie Club took part in the 9th Annual Anthony Ford Pond Hockey Classic, held at Spring Lake Park in North Mankato, MN. The annual tournament is played in memory of Anthony Ford. Anthony was nine years old when he lost his courageous battle with cancer. Anthony was bright, outgoing and compassionate with a love for life. Throughout his 18 month battle, Anthony lived his life to the fullest, determined never to allow his disease to interfere with doing things that he loved. Anthony loved playing hockey and dreamed of one day playing in the NHL as the “Next Great One”. Prior to his passing, Anthony had the opportunity to meet his mentor and hero the original “Great One” Wayne Gretzky. 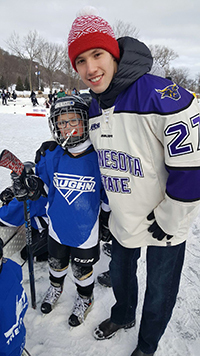 Anthony was befriended by the MSU Maverick hockey team and a banner bearing his name hangs in the Verizon Wireless Center to remind us of his courage, determination and dream of playing in the NHL. 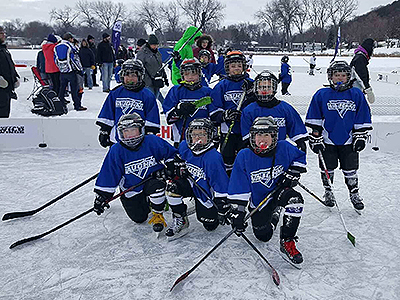 In the spirit of Anthony’s dream of playing hockey, the Anthony Ford Committee was founded in 2007 by friends and family to establish a fund to help find a cure for childhood leukemia and help other young hockey players be the “Next Great One”. Proceeds from the event support Therapeutic Advances in Childhood Leukemia and help keep hockey affordable in our area.